Millet and Monet: Shedding Light on Truth | on art, etc. The radical movement of an art representing the familiar as it were – of an art closer to life – completely opposed contemporary expectations. Straying away from academic dogmas, aspiring artists of the Belle Époque admired the masters, allowing for their influence to take effect and yet, made great strides to define their own manifesto. Impressionism, as the style came to be called, captured moments of real life, full of sparkling color and ephemeral light, leaving its audience with a vague, sketchily executed impression. Claude Oscar Monet fathered this forward-thinking, unconventional movement that shocked the artistic community. Jean-François Millet, however, reigned just before the real beginnings of the avant-guard change. He was a Naturalist, a Realist: he depicted real life without imaginative idealism. Both styles stress an importance of color over form, enabling freer execution: the artists did not blend the colors imperceptibly, but left the brushstrokes clearly visible all over their canvases. Their motifs centered on the simple and ordinary, choosing to depict the humanity of their own day, just as they saw it – its ugliness as well as its beauty. 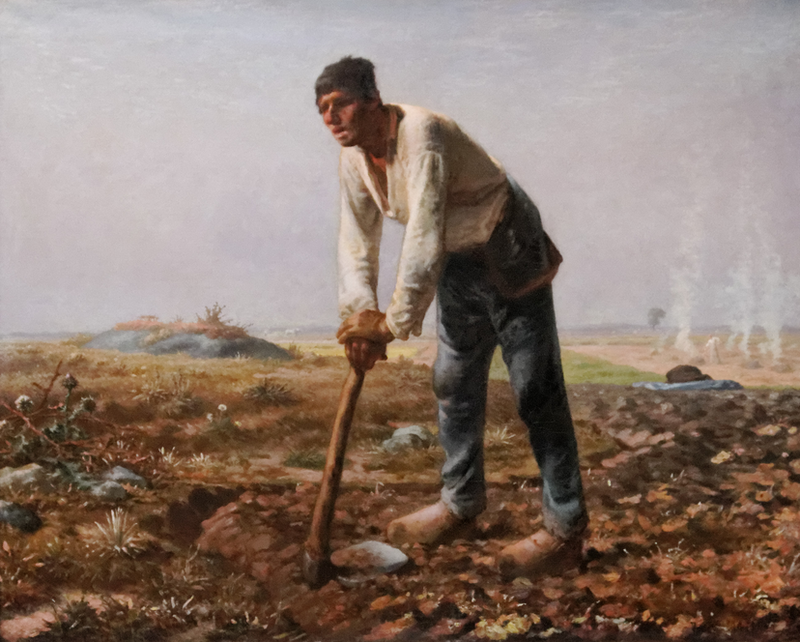 In Man with a Hoe, 1860-1862, French painter Jean-François Millet masterfully glorifies the everyday hero. A man, tired and dirty, leans on his tool in a moment of solace from his strenuous labor. This centered figure, the Everyman, faces left, cheating his body toward the viewer. His large brown boots appear hulky and heavy, almost stone-like, seemingly weighing him down. Painted in the same yellow-brown as the ground, his shoes appear to be an extension of the earth itself, making a statement about the close bond between man, earth, and therefore, god. The figure wears dark, ruffled blue-jeans, spotted with dirt and mud. Only slightly illuminated, a single suspender hangs from his waist. His creamy-white long-sleeved shirt, although tucked in, droops over the denim waistline, loosened by the peasant’s drudgery. The garb is yellowish from sweat and soil. The man’s dark burnt-brown complexion, the result of overexposure to the sun, is vaguely illuminated by a mustard-yellow on his lips, forehead, nose and cheeks. Although his face it lit, the blots of light color give him no definition, and hence, no individuality. His large, brutish nose bulges from his face. His mouth gapes open, releasing an exhausted sigh or perhaps gasping for air. Shaded, dark, and indistinct, the farmer’s eyes stare beyond the edge of the work, looking downward with fatigue. His head with its short, messy mop of dark brown hair wearily gazes. The Everyman stands shoulder width apart, legs straight, back slumped and arched over. He rests atop the wooden handle of the hoe; its iron blade planted into the ground. His posture, along with the slightly angled position of the gardening tool, creates a triangle of focus, forcing the audience’s attention to concentrate on the image of the utterly jaded figure. The horizon splits the background: a grayish-pink sky above and brown earth below. Millet smoothly paints the empty sky, suggesting clouds with thin white strokes. He pays closer attention to the detailed depiction of the ground. Worked soil surrounds the peasant; a thin trench outlines his progress. Beyond the trench grow patches of dandelions and other weeds. The untilled grass marks the work that lays ahead. Placed neatly behind the man lie a folded periwinkle garment and a hat. Discarded, these objects allude to the temperature: an overtly agonizing heat. In the middleground, at right, a figure stands among smoking stacks. Toward the center of the scene, a cow followed by another working figure plow the field. A path recedes to a single tree. Distant violet hills separate the sky from land. In Millet’s savage, rugged reality, void of beauty, the farmer transcends hopelessness and destroyed ambition. Turning rocky, thistle-ridden earth into a productive field is backbreaking labor. The subject’s hard, incorrigible conditions seem never-ending. This man, however, upholds dignity and courage in the face of a life of unremitting exertion. Ennobled, he stands as a symbol of the laboring class, a tribute to the peasant’s plight. He paints an accurate, detailed, unembellished portrait of contemporary life, rejecting idealism and its academic standards. Comparatively, French Impressionist Claude Oscar Monet explores nature’s immediacy through the mutability of light, atmosphere, and climate in his Wheatstacks, Snow Effect, Morning, 1891. 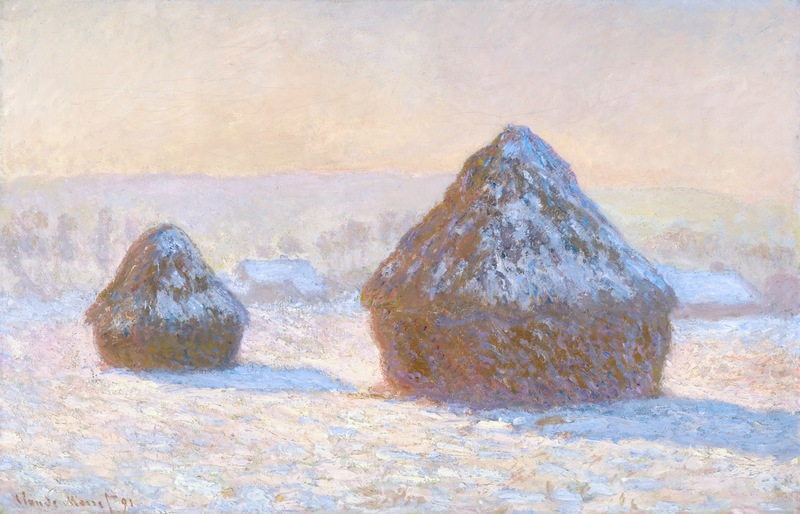 Monet arranges a simple, basic composition of two off-centered solitary wheatstacks amidst a crisp, clear winter. The sun powerfully illuminates the scene. From beyond the left side of the work, it shines, directly lighting the two stacks to create a warm, red-orange glow. The consequent blue and violet shadows angle obliquely. The larger haystack at right stands before the more distant, and hence, smaller at left. The line of their shadows connects them. The open snow-covered field of muted pinks and purples recedes into an illusionistic, logical sequence of receding planes. Parallel bands of field, hills, and sky solidify the work. The backdrop, faint hills along the left bank of the Seine River and Giverny houses shrouded by a line of poplars, is fairly indecipherable close up, but becomes clear when contemplated from a distance. In contrast, the solidly formed geometric structure of the stacks prevents the surface from simply melting together. Light envelops the stacks, illuminating them without the use of contour lines. The juxtaposition of the light colors of the sky and the dark colors of the wheatstacks produces a pop effect, allowing the forms to jump out at the viewer. The forms are more harshly treated, otherwise they threaten to dissolve into the colored light. Flecked with blues, pinks, purples and reds, the reduced palette appears frozen and dormant like the season itself. The harmonious colors unify the canvas. The pinks in the sky echo the snow’s reflection and the blues of the wheatstacks’ shadows. Monet’s haystacks – mundane, hardly beautiful, mute things – appear mysterious. The haystack, an ordinary element in northern France’s agricultural landscape, at the time, was an unlikely subject for a painting. Structurally complicated, built according to specific guidelines, these enormous stacks of harvested grain rose fifteen to twenty feet. They stored ears of grain, using hay or wheat to cover them from the elements until threshing season. Wheatstacks were a village’s most important commodity, representing wealth, productivity, sustenance, and survival. Creative understanding during the late nineteenth century followed highly technical Classical ideals. Works resembled a colored photograph in manipulating paint to refine as much exacting detail as possible. Artists were expected to illustrate certain subjects: either religious episodes, mythological stories, or historical accounts. Any deviation from these standards proved unacceptable and, consequently, unsuccessful. Hence, popular belief argued that painting demeaned itself by depicting aspects of everyday life. The new radicals daringly continued with their ordinary themes and sketch-like paintings. The purposely visible paint strokes which characterized their art left popular critics criticizing their “unfinished” work. Both these works, on display at the Getty Center Museum in Los Angeles, California strongly renounce traditional neoclassicist values. Their ideas were set against the ideal, the transcendent. The artists, Monet and Millet, use raised, broken brushstrokes of oil paint to create nuances of light. Monet even goes so far as to use an impasto method to simulate the thatched texture of the wheat. Both were not linearly invested; they used light against forms to demonstrate perspectival space. Moreover, they chose, as their subjects and focus, the themes of contemporary rural labor, Monet with his haystacks, and Millet with his peasant worker. Previously, servants were illustrated in subservient positions, and the agricultural landscape was by no means elevated to the status of a the central image of a work of art. Artists, at that point in time, fled the urban decay of the commercialism and industrialism of the city for the serenity and solace of nature. Built by man, but created by nature, the topography of Wheatstacks alludes to the industrialism Monet attempted to leave behind. Far from the commotion of the modern city, Millet too references the industrial pollution with the billowing smoke of Man with a Hoe. Charles Baudelaire’s vision of modernism encompassed an understanding of the uncontrolled spontaneity of life. The manner in which Monet documents ephemera – the shimmering views, the dissolutions of form through layer upon layer of thick paint – proves that representation of this lapse of time required prolonged and personal examination. These “instant glances” and “quick looks” entailed more than mere momentary study. Embracing the language of paint, Millet similarly captures a moment of utter exhaustion. These masters laid down pigment on a two-dimensional surface with an unfinished quality. They diverge from the finished and illusionistic approach. Even Monet’s haystacks were once living things, but they are now dry. These haystacks serve as a metaphor for Monet’s now dry paint. The bright, unmixed colors, the quick, short strokes, the flickering of light and shadow, simply, the paint against paint – this is how Claude Monet and Jean-François Millet became painterly painters. Very interesting comparative study of Monet and Millet, through these two paintings. It was a pleasure.